CSS supports EPA's ASPECT program by providing expertise in remote passive infrared (IR) chemical detection. 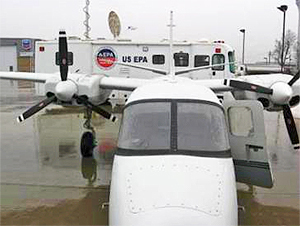 ASPECT is the nation's only operational 24/7 airborne chemical and radiological emergency mapping capability. ASPECT detects 77 compounds in real time in the aircraft and 538 on the ground. CSS personnel have more than 20 years of experience on this program, specifically providing expertise in vibrational/rotational spectroscopy; interferometer and dispersive-based IR spectrometer design and operation; Fourier-based data analysis; interferogram-based data processing; Finite Impulse Response (FIR) and Infinite Impulse Response (IIR) filter manipulation; and multi-variate analysis (including piece-wise linear and support-vector analyses). CSS has enhanced ASPECT data processing capabilities in geo-registration methods of image and raster data, web-based data display (such as Google Earth), and File Transfer Protocol (FTP) operations. We have mobilized our staff and ASPECT data processing equipment to numerous sites including the Deepwater Horizon oil spill (where it became a key asset in monitoring the spill and directing deployment of the oil skimmer vessels), 2010 and 2011 Rose Bowl, and Super Bowl XLV, among several other high-profile events. The ASPECT team provided chemical and radiological screening including preflight equipment testing; supported all flights with software engineering, data analysis, contouring, and communications setup; and supported all flight briefings and briefings to the Incident Command.